After a couple legging-ridden winters, having tried sequins, waxed effect, faux and real leather, metallics, geometrical and other patterns, I thought it was high time I expanded to other solar systems with my new galaxy printed leggings. I matched them with a mesh detail jumper, purple Balenciaga clutch and the much cherished MMM for H&M booties from the last collaboration. Surpassing my brother's remark that in this outfit I remind him of one renowned macbook wallpaper, what do you guys think? This leggings are so fun! I want them! 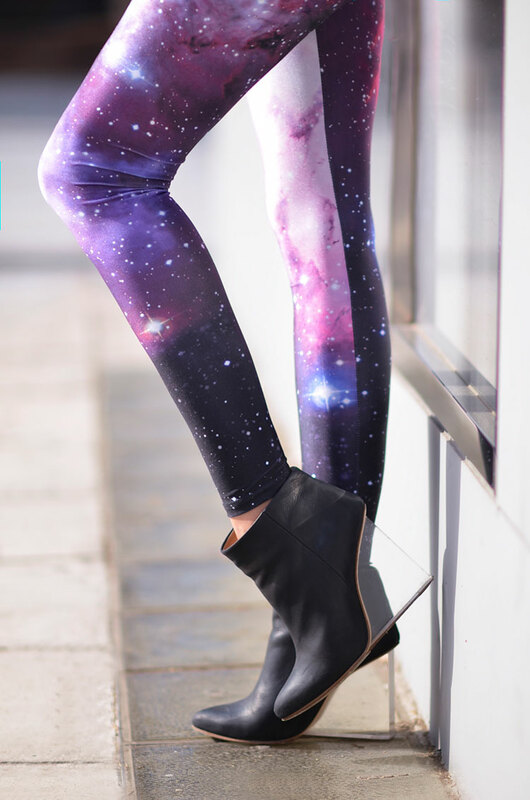 Love galaxy print leggings! Cool outfit! Awesome leggings & love the clutch! Those pants are so rad. Cool look! :) .. I couldn't wear leggings as pants, but they look great on you. This must be every sci-fi nerd's fantasy! Love this look! Thos heels totally enhance the effect! Amazing booties! Love this outfit! Fantastic outfit, so colorful and fun! Love it!